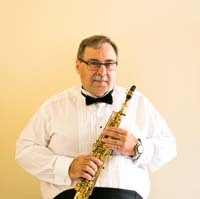 Bio: Vadim Arsky saxophonist, conductor and arranger. Got his Bachelor degree from University of Brasilia - Brazil (1987) and his Masters from University of Louisville (1990) in saxophone performance. Since 1994 is the saxophone professor of the University of Brasília where also teaches chamber music and Bossa Nova studies. Vadim Arsky was the winner of the Eldorado Prize in 1991 and also, was semifinalist of the East and West Competition for the Carnegie Hall in 1995. As a saxophone player, he develops a carrier as a soloist, chamber musician and is a member of the Com Domínio do Sax, one of the first saxophone quartet in Brazil, besides developing a popular music performance carrier, playing Jazz, Bossa-Nova and Chorinho. From 2006 to 2013 was the director of bands of the American School of Brasilia In 2015 moved to Florida to pursue his PhD degree in Music Education at University of Florida. This ensemble was created specially for this NASA 2018 Bienal. Vadim Arsky is the saxophone professor of Universidade de Brasilia, Brazil. He has his bachelor degree in saxophone from Universidade de Brasilia, a M.M. also in saxophone from University of Louisville and is now pursuing his PhD degree in Music Education at University of Florida. Bruno Medina Pegoraro is a very active saxophonist in Brazil, has a master's degree in Jazz performance by University of Louisville and is now living in NY, NY and traveling all over the US playing, recording and giving lectures. Mike Tracy is the Jazz program director at University of Louisville and a "real embassador of Jazz". He has been traveling all over the world playing. lecturing and giving clinics on jazz performace and education. Fernando Arruda is a brazilian saxophonist, composer and record technitian with a bachelor degree from the New School of music and master's degree from the New York University. Mike Tracy Tenor Saxophone A veritable Ambassador of Jazz, Professor Michael Tracy is one of America’s foremost jazz educato . . .
Bruno Medina Alto Saxophone Bruno Medina Pegoraro is a saxophonist with international reputation, specialized in Brazilian musi . . .
Fernando Arruda Alto Saxophone Fernando Arruda organizes sounds. As a multi-instrumentalist performer (saxes, flute, clarinet, pian . . .
Tabajara Belo Acoustic Guitar Tabajara Belo holds a bachelor degree in guitar from the UFMG, Brazil and Master of Guitar from th . . .